Thousands of people injure their elbow joint each and every day. 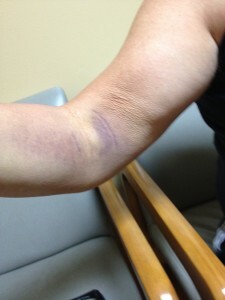 An important part of the elbow that can easily get injured is the biceps tendon. The biceps is a muscle located in the front part of the upper arm that goes from the elbow to the shoulder. Tendons are what attach the muscles to the bone. Within this region of the upper arm, there are two groups of tendons associated with the biceps muscle. One group attaches the upper part of the biceps to the shoulder (proximal, or upper biceps tendon), while the second group attaches the biceps to the elbow (distal, or lower biceps tendon). The lower biceps tendon—the distal biceps tendon—can become injured from excessive loading or from a violent force and can lead to tearing or ‘rupture’ or the tendon. Most often, this injury occurs among middle-aged men during heavy training workouts or in jobs where heavy lifting is involved. If the violent loading occurs with the elbow bent, the biceps muscle or tendon can tear. This injury can be very painful and most often is accompanied by a loud ‘pop’. There will be pain and there can also be discoloration under the skin or distortion of the normal contour as the muscle itself bunches up above the elbow. 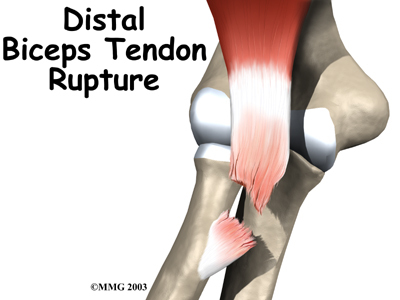 Distal biceps tears and ruptures are somewhat uncommon accounting for about three percent of all tendon ruptures. Treatment for torn biceps muscles varies. While nonsurgical treatment can be used, most active individuals who experience a distal biceps rupture will opt to have surgery so that full arm strength can return. Non-surgical treatment for torn biceps muscles is best suited for those who have only a partial tear or those who are very low demand in their activities. Non-surgical treatment consists of protecting the arm, resting the arm in a sling, and managing pain with common over-the-counter medications for inflammation and pain. If the biceps tendon has torn completely, surgical repair can be a good option to restore function and to decrease pain. Dr. Kevin Yip uses a minimally invasive surgical technique to repair a distal biceps tendon tear. This is usually done right after the injury occurs and is done to reconnect the tendon to the correct location on the bone from which it has torn. For more chronic injuries, where the tendon has retracted or become severely scarred, a graft may be needed to reconstruct the torn tendon so that function can be restored.